Message #1 Posted by troy on 5 Feb 2012, 4:07 a.m.
first thanks to walter, pauli, and wp34s for their work on the project! and thanks to gene for the cable. i've finally flashed and put the overlays on my wp34s. 1. Color scheme: f = orange; g = blue; h = yellow. i didn't like the green look on the original (no offense to walter/pauli); the green looked very dark on my printer no matter how light i get try it and i can't see it well. the yellow color isn't great, but i think it's better. 2. i put the f and g functions (orange and blue) above the key, instead of below. i'm more used to this layout. 3. used BIN, OCT, DEC, HEX instead of 2, 8, 10, 16, respectively. 4. CHS instead of +/-. 6. alpha characters on the lower right of the key instead of the lower left. 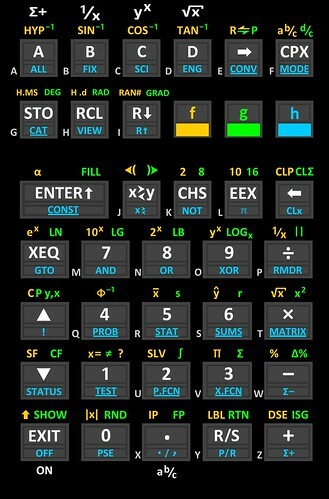 i'm also planning to write a user's manual for the calculator that can be printed and bound. it will be based largely on the 15c, 32sii and 42s manuals. hopefully, i'll finish the manual by end of march. 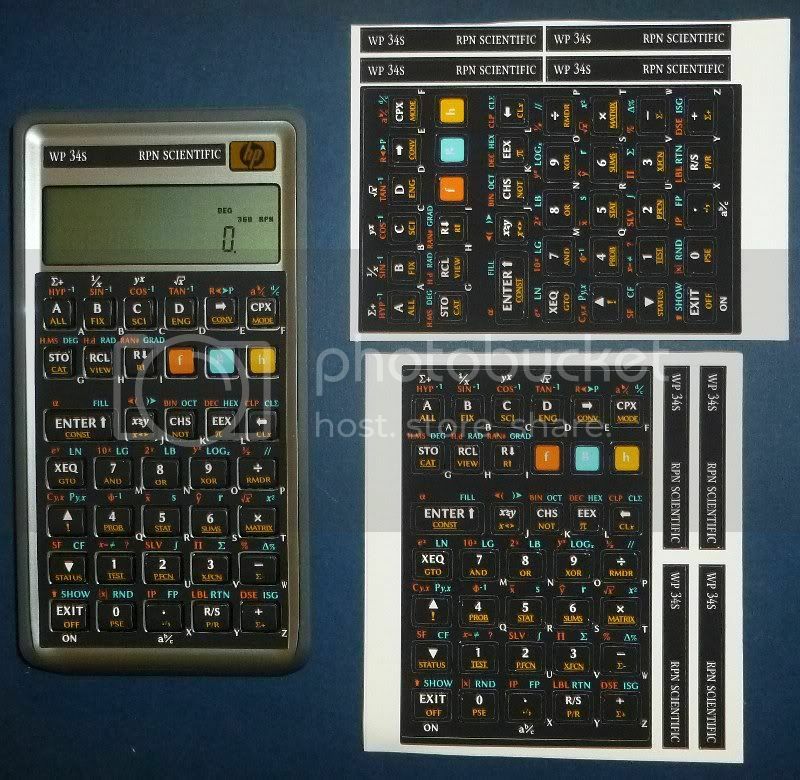 my plan is to flash some calculators, apply the overlays, and print and bind the manual and give it as a gift to some friends. I have engineers, college professors, and scientists friends that might appreciate the gift. none of them are RPN users, but hope to convert them to rpn through wp34s. i'm trying to compile the firmware to individualize some greeting and include the name of the person to whom i'll give the calculator to. Are you also selling your overlays? Cost+shipping worldwide? anyways, something like the price that eric is selling would be ok with me. looks pretty neat... might i suggest that the letters 'f' 'g' and 'h' be printed in black to make them stand out more? btw, a customizable greeting message would be a nice option in general, perhaps moving the developer's names to an 'about' menu item. Very nice and great to see this kind of customization by users!!! While I still prefer Walter's design of font, colour and base labelling (perhaps because I've been using it for 6 months) the one think that immediately strikes me is how much better having f and g labels above the keys looks. For example I still have to think to not hit f - instead of f x for sqrt(). 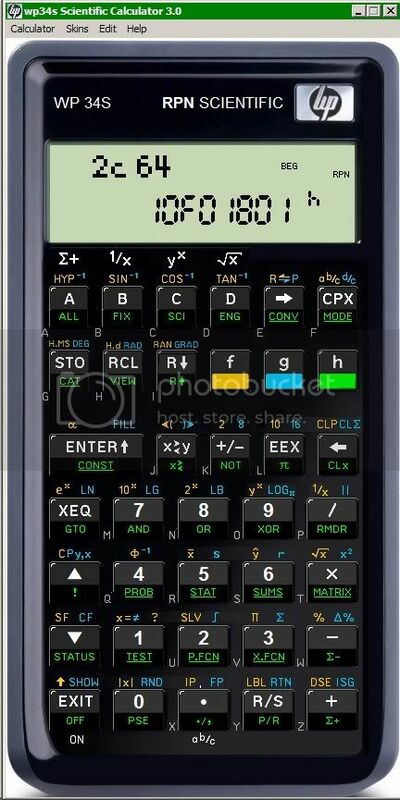 Either because it is more natural (finger does not obscure the label as I push the key) or because that's what every HP calculator I have used did (HP-15C and HP-48SX). BTW - how do you make yours? Do you have your own cutting machine? i used inkscape for the layout and the silhouette cutting machine. i think both of these have been discussed here before. but inkscape mainly because it is free, and linux libertine fonts because it is also free. I am going to try using this with the emulator for a while and see how I like the f and g labels on top. Already I like that when converting between decimal and hex, I don't have to lift my finger to see which key I'm suppose to press. IIRC we already had this debate - can't remember why "under" won out? All shifted labels are found on one side of the key. Is more logical IMHO and needs less real estate, resulting in a cleaner design. The default primary functions in the top row fit nicely. @troy: Nice job - but I wouldn't choose orange and yellow: too little difference IMHO. Did you try red instead of orange already? And I continue prefering the shifted labels on one side ;-) And please choose another font for 'g'. Edited to emphasize point 2. I like this one. I'm used to the labels above the keys so I like that also. Please see my post in your new thread. Thanks. I also like that your small x’s and y’s as in 10x, yx, Cy,x, etc. are in a font that closely matches the classic HP font for these characters. Was it an oversight that the “x” in the "1/x" above the "B" key does not match this font? Edited: 6 Feb 2012, 4:39 p.m.
What I would really like to see, though, is for the h-shift legends on the sloped portion of the keys to be blue, because they are blue on the voyagers (except the 10C which has no blue shift key) and the 41C series, and so it just seems like they should be blue. Yeah, those too. Even more justification for blue! Are we talking about h-shifted functions or merely functions on the slanted part of the keys? Classics: Yes, the HP65 has blue functions on the slanted portion of the keys, but those are g-shifted. The HP67 h-shifted functions are on the front portion of the keys and are black. Woodstock (25, 29C) and Sting (19C): The scientifics have blue functions on the slants, but they are g-shifted. Spice: The 32E and 33E/C have blue functions on the slants, however they are g-shifted. The 34C has h-shifted on the slants (like the 67), and they are black (like the 67). I think we are talking about whatever appears on the slanted portion of the keys. If this change were to be made to an alternate wp34s overlay, the blue functions would be h-shifted instead of g-shifted. 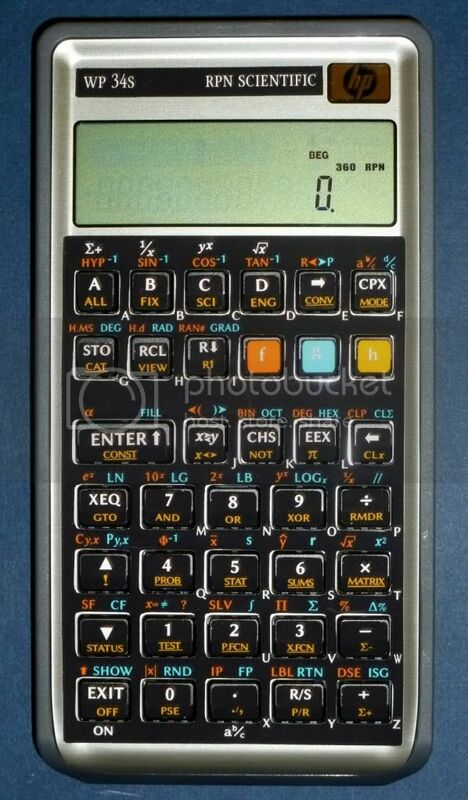 To stirr the pot a bit ;-) traditionally g-shifted functions were inverting f-shifted ones, starting with the HP-55. The HP-65 had that famous f^-1 shift key, but that was the one and only. Walter said: "The HP-65 had that famous f^-1 shift key, but that was the one and only." This seems like it's turning into a poll. 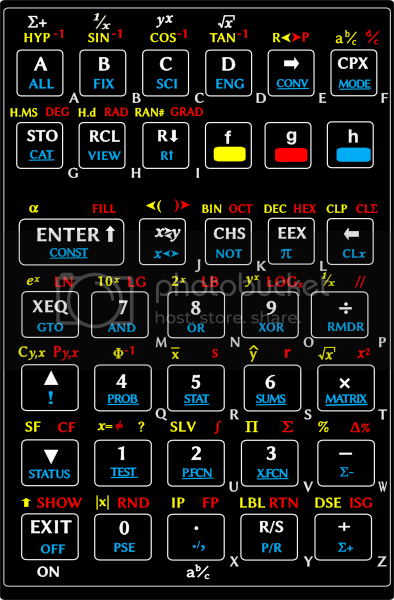 That said, almost every popular calculator, modern or vintage, has key functions printed above the keys. I prefer this, and it seems many others do too. I'd pay for an overlay with top labels. I agree with the arguments for blue slant labels. Unlike the OP in this thread, I think the choice to use bright yellow for the f functions makes perfect sense - they are those I use most often, and it makes them stand out quickly. My ideal overlay would simply swap the blue and green colors on the overlay, and have function labels at the top. I find that it is difficult to distinguish the blue from the green in low light conditions so would prefer higher contrasting colours. Love the idea of labels on the top! When I have some time I will take a stab at editing Eric's inkscape and Silouette files. While I have no objection to swapping green and blue, but I loathe to change the green, aside from maybe lightening it up. I prefer Walter's original aesthetic of analogous colours (e.g. from one side of the colour wheel). Replace the green with a red turns it looks like a kid's toy as the colours are no longer complementary nor analogous. But... I did manage to solder several sets of crystals and caps a few months ago. Can't be all bad! Yellow stands out, and (for me) those are the most used functions. Blue on the slants is somewhat muted, and those (again, for me) are the least-used functions and menus. If Eric builds them, I will buy at least 2 more. If you want a custom overlay for the 34S, send me the image you want used (make sure the size and positioning of the keys stays the same as my template image) and I'll make as many as you want. Just give me a little lead time. I was referring to the slanted part of the key. i agree that orange and yellow are hard to distinguish. i would love green but my printer just can't print it good enough to be seen properly. it always comes out dark no matter how light i set it---but if too light, it gets washed out. so i settled for red. it does not look too good on the screen, but once i laid it on the keys, it actually looked nice, at least to me. and i can see it---the most important part. i also changed the f/g/h fonts to Helvetica---people in Switzerland are loving me now! anyway, here's what i changed it to. The little bit of industrial design instruction I got really stressed the importance of choosing colours carefully.. If this was, for example, a piece of safety equipment we would use 3 colours as far apart as possible from each other (red, blue, yellow) with saturation adjusted so that people with trichromacy can still distinguish between them. The same rule seems to be followed when designing children's toys. 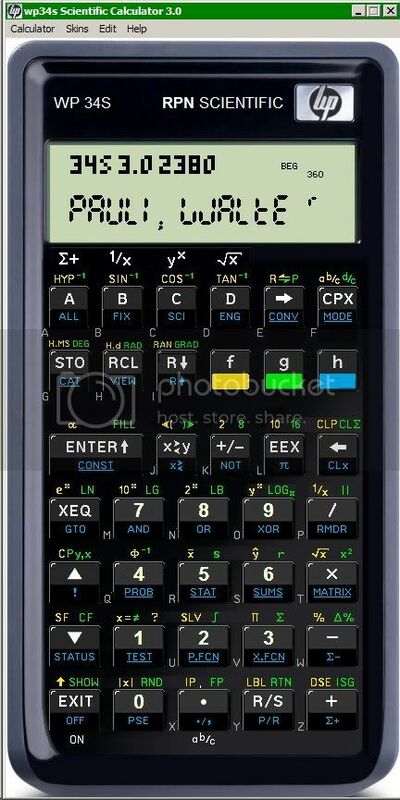 However for a calculator, I think a more subtle approach is needed.